Who is the devil "you" know? In the pages of "The Sociopath Next Door," you will realize that your ex was not just misunderstood. He's a sociopath. And your boss, teacher, and colleague? They may be sociopaths too. 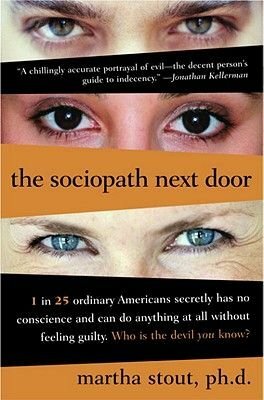 We are accustomed to think of sociopaths as violent criminals, but in "The Sociopath Next Door," Harvard psychologist Martha Stout reveals that a shocking 4 percent of ordinary people--one in twenty-five--has an often undetected mental disorder, the chief symptom of which is that that person possesses no conscience. He or she has no ability whatsoever to feel shame, guilt, or remorse. One in twenty-five everyday Americans, therefore, is secretly a sociopath. They could be your colleague, your neighbor, even family. And they can do literally anything at all and feel absolutely no guilt. " The fact is, we all almost certainly know at least one or more sociopaths already. Part of the urgency in reading "The Sociopath Next Door" is the moment when we suddenly recognize that someone we know--someone we worked for, or were involved with, or voted for--is a sociopath. But what do we do with that knowledge? To arm us against the sociopath, Dr. Stout teaches us to question authority, suspect flattery, and beware the pity play. Above all, she writes, when a sociopath is beckoning, do not join the game. It is the ruthless versus the rest of us, and "The Sociopath Next Door" will show you how to recognize and defeat the devil you know.